The night before I headed out of town it was Maggie’s turn to take over the kitchen for dinner. She opted for sushi rolls which we’ve done once before. As with the last time is was easy, but very messy (who’d have thunk sticky rice was so sticky?!). Miss M was especially gracious, and let Bjørn join in on the fun even though he’d insisted on making his meal all by himself. We made the rice following a simple recipe on About.com. We also heated up a whole pre-cooked and marinated eel which we bought at a local Asian market. While those were cooking Maggie set to chopping and prepping the other fillings: crab meat, cucumbers, sushi grade salmon, and salmon roe. Rolling the sushi in the Noori (seaweed sheets) was a bit tricky because we needed to make them snug so the fillings didn’t flop out. Luckily, we’d bought bamboo mats (that I’m sure have a name), which made the task much easier than doing it all free-hand. It was so delicious and filling, I’m looking forward to making this again soon! Wow, I am impressed. Sushi is messy and hard to make. i remember my mom getting up super early one morning to make it for a party and accidentally used Sake instead of rice vinegar – doh! I enjoy making sushi rolls too. Unfortunately our kids haven’t learned to enjoy their taste yet, but they are a favorite to adults! yes, home made sushi is an art. I took the kids for sushi today…love it. When I was an event planner at a University, we used to do this all the time with the dorm residents. 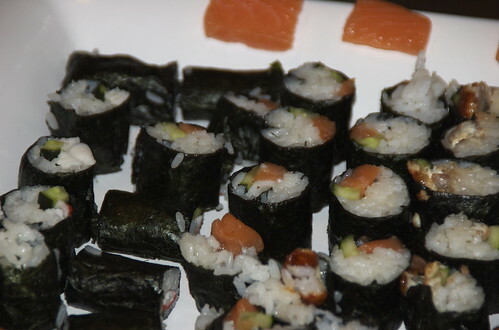 Sushi parties were a big hit. I am so impressed that you can do this with your kids!